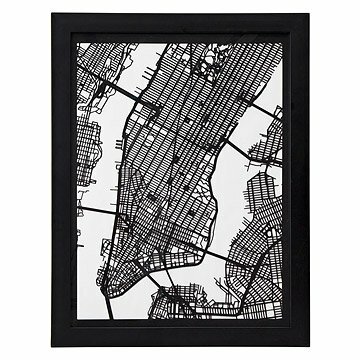 Keep your favorite places in your heart and on your walls with an eye-catching, papercut map of some of the nation's great cities. Artist Dan Linden laser cuts street maps onto recycled mounting board, with just enough thickness to gives dimensionality to the delicate lattice of intersecting streets. Pick out your home or favorite vacation destination, or display a cluster of iconic cities to show of their unique geometries. Made in Ohio. I bought this for myself using a gift card. I love maps anyway, and this was a great addition to my living room. The map is incredibly intricate, and really unique. When you look at this map from an angle, it is such an interesting view! It's a great conversation piece, and since it's not flat (like a print), it has a ton of character. I love this map! I wish I had money for more of them! Pay tribute to your favorite city with these beautiful, laser-cut map art pieces.